Spit Your Venom. 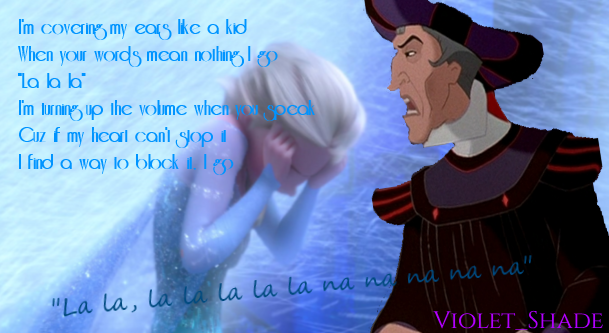 So many times in her life, Frollo tells Elsa that her magic is nothing but a curse, and a sin, and that she was a witch...Elsa hates it and refuses to listen. Based off of the song "La La La" によって Naughy Boy. 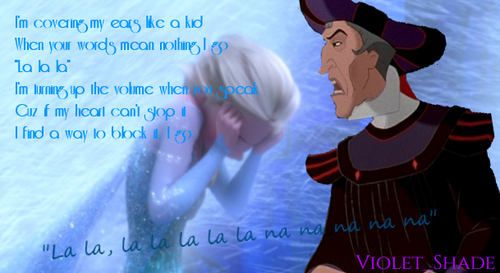 Wallpaper and background images in the ディズニーのクロスオーバー作品 club tagged: photo elsa frollo frozen hunchback of notre dame vioshade. This ディズニーのクロスオーバー作品 photo might contain 肖像画, ヘッドショット, クローズアップ, ポートレート, ヘッド ショット, and クローズ アップ. "Do あなた Believe In Fairytales?"